Famous people born on APRIL 21 are Taurus the Bull! They are a personality to be proud of. They love with all their heart and soul. They are warm and generous. There are so many good things that could be said about them. As a Taurus, home is important to the famous people born on April 21st. Most of all, they value their individuality and their liberty. When they party, they tend to have a good time. Normally, they will have stories to tell that will live on for generations to come. They love to talk. So they will need a partner with a good and strong listening ear. For that matter, they will talk a stranger’s ear off. They need stability in their life, however. Now, as a negative quality they can become possessive and jealous. 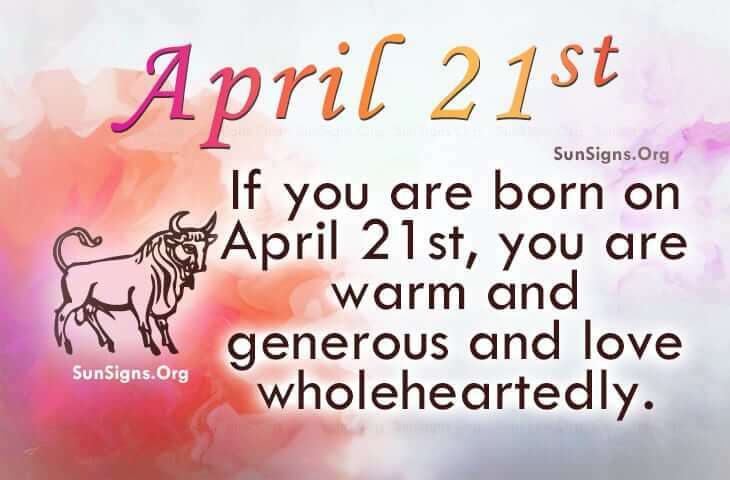 So those born on April 21st need to find a way to deal with these insecurities before they get out of hand. This might also cause them to lose the very person they love so much. Famous people born on April 21st love family and reunions although they are a homebody. It is advised that they have some fun and not be so self absorbed. Relationships with a Taurus will more than likely turn into a lasting one. And they also take life seriously. Get a list of April 21st famous celebrities below.